I cannot live without it! I have super-fine hair. Traci gets sick of my complaining about it, but "baby-fine" does not even begin to describe it. If I do not put some product in it and blow it dry, it falls limp around my face in the most unflattering way. On the positive side, it's very soft to the touch, but seriously, I'd trade softness for a little volume any day! 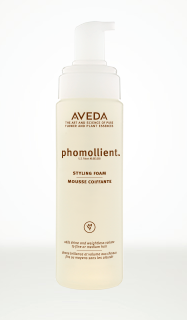 My stylist, Erin Walterhoefer at Van Michael Salon in Buckhead, recommended Phomollient about fourteen years ago, and I've been using it ever since. Over the years, I've experimented with other products, but I keep coming back to the Phomollient. It is very light, which is exactly what I need to keep from weighing down my hair, and it gives just a little texture to add some volume. Now you know what I cannot live without! What's your hair obsession? I used to use aveda products all the time in my hair, but then decided that they were too expensive! When you find just the right product though, it makes sense to stick to it. I don't think I have a favourite hair product as I get bored so easily I like to try different ones. I will look out for this though, as I have fine hair too! It is truly the only product that doesn't weight my hair down or give it some weird texture! I definitely recommend it! Pregnancy does a number on your hair for sure! Give it a try!